Is hiring a wedding planner right for you? 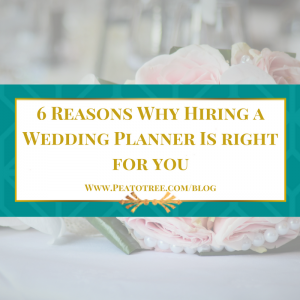 We have talked about what a wedding planner does, now it is time to decide if hiring one is right for you. The decision to hire a wedding planner can be a tough one, but it could be the best investment and decision you make in the wedding planning process. Our team, at Pea to Tree Events, truly believe that your wedding day should be a true representation of you, with the guest experience that goes with it. No stressing your friends and family out during the process. Allow them to not lift a finger on the day of, but rather have fun, and celebrate you as a couple. 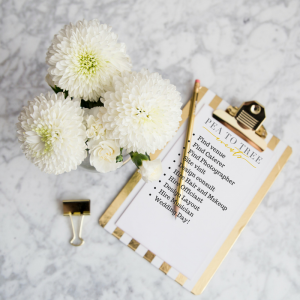 So, before we give you 6 reasons why you should hire a wedding planner, answer this question: How much is your time, energy and mental well-being worth? You are a professional who works full-time, travel and spend time with family. Did you know it takes roughly 250-300 hours to plan a wedding? The leg work that it takes to plan, interview, compare quotes, coming up with ideas, designing, and pulling it all together is a huge undertaking. Do you really have that much time on your hands? We do! We save you time to not only do thing you truly enjoy doing with your friends and family, but we also save you time, you get of spent perfecting your craft at work. Let us take care of the details. During the planning process, do you want to spend late nights being overwhelmed and exhausted? There will be time you will need to make decisions, and have tense conversations with your family. Bickering with your fiance is the least thing you want. 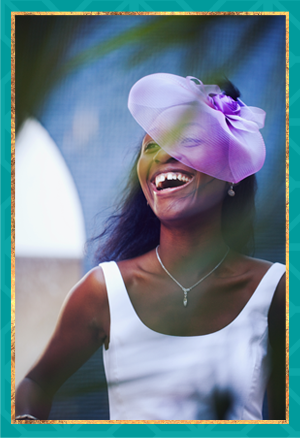 One of the reasons to hire a wedding planner is to reduce the stress around you. The process should be enjoyable and getting to know each other on a deeper level. It is better to hand things over to your wedding planner, as we help you save energy and many unwanted arguments. In other words, gives you peace of mind! Do you know for the last 6+ years that Event & Wedding Planner jobs have landed in the top 5 lists of most stressful jobs? Why in the world would you want to put yourself or your family through this stress? 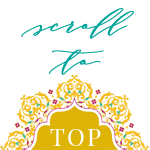 By hiring a professional wedding planner, you are guaranteed to have peace of mind. When I say a professional wedding planner, I don’t mean your cousin who worked in a flower shop in college, or a friend who just planned their own wedding. What happens when that person gets hit with a high-stress situation, do you know how they will react? Not trying to scare you, but unpredictable things happen at weddings. Why would you put that stress on the people you love? They are here to celebrate you and enjoy being by your side. Wedding planners have been doing this for a while, and know how to be proactive. Having one will give you the peace of mind that everything is going as planned. Creating a realistic budget and sticking to it is one of our priorities. Going over budget is easy, therefore having a planner helps in not overspending. The unnecessary things that may clash with the overall design. As wedding planners we not only have great vendor relationships and good knowledge of pricing, but we can help you save money by making wise decisions. We create a budget based on your wedding vision and allocate an amount to each of the category (ex: photographer, Flowers, venue, etc.). We will keep you on track with your budget, and see where you can save as well. As a wedding planner, we know how to pair you with the right vendors. Your team of vendors will be the ones to create your wedding vision, so working with individuals you love, trust is very important. Having worked with so many vendors in the industry, we not only know who will compliment your personality and style, we also know who is reliable and professional. Hiring a planner before contracting vendors, can save you many mistakes along the way. We review your contracts and make sure you are not missing any important details. Hiring a planner can help with putting your scattered idea into one cohesive design, from the right lighting selection to the presentation of your food. Here at Pea to Tree Events, we not only want to deliver an organized event, but an all around beautiful designed event, that your guests can’t get enough of. Now, when hiring a planner, make sure they actually can help with the anesthetic of your wedding, as not all planners have the gift to be a logistical and design guru. Don’t worry though, PTE got your covered!! Interested in hiring a wedding planner for your Florida wedding? Let Pea to Tree help you in achieving the wedding of your dreams from start to finish! Contact us today! Georgette Casimir is the owner and creative director of Pea to Tree Events, a boutique planning and design company specializing in Multicultural, luxury weddings and highly personalized events. PTE is based in Florida and serves all of South Florida, Tampa, Orlando, and destinations beyond with impeccable and exclusive wedding experiences. Connect with Georgette today at 727-537-0737 or Events@peatotree.com about your special event. « What does a wedding planner do?